The ultralight down sleeping bag Robens Pamir 250 waits with an atypical zipper on position and can be used for ultralight hikers also up in late autumn yet. I now had him many nights under the open sky in use. Whether the sleeping bag is suitable for your intended use and your preference, you can find out in this sleeping bag test. With a filling of 250 grams duck down in the mixing ratio 90/10 (down to feathers), he is by the manufacturer as a 1-2 season bag marketed. Through the skillful use of a change of clothes in a sleeping bag inside , the clever ultralight hikers the temperature range may be even a little stretch. 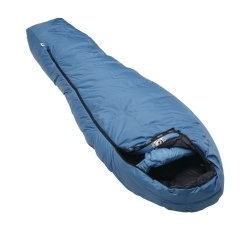 But how good is the thermal performance and insulation of the sleeping bag without additional layers of clothing? All near the Robens Pamir 250 is meticulously crafted and down proof 20D nylon taffeta fabric makes its name. Only in a few places now appear after 2 months of use a couple of mini-down of the seams produced. The same I could with my ultralight down jacket Cumulus Watch. There, the minimum down loss but has had no appreciable effect on the capacity. 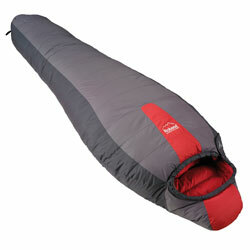 In contrast to the more expensive down sleeping bags, in which Robens Pamir 250, the filling only in X-chambers housed. The seams of these X-chambers can be cold bridges to the surrounding air, and therefore, for example, in thesleeping bags of Cumulus replaced by H-chambers. These H-chambers enable the seams in the inside of the sleeping bag and no longer in direct contact with the outside. Thus we touch while sleeping no outer seam more and the isolation is somewhat better. The hood of the Pamir 250 is enabled by a very elastic band fixed simply at the top. This is also enclosed reliable. This is true but on almost every sleeping bag in which I have slept on. What makes the Pamir 250, however, he only has a half zipper. But this does not at the side, but on top of the sleeping bag. The advantage of this position has not revealed to me directly. Only when they go camping during summer temperatures I felt the difference. Is it night still between 15 ° C and 20 ° C warm, then you open the zipper and the isolation can be easily folded away to the left and right. No to warm down layer that lies on you and makes you sweat. Especially for back sleepers which is advantageous. And side sleepers at a disadvantage? On the contrary! 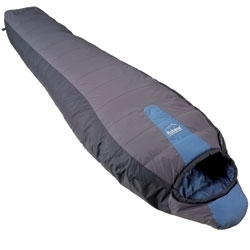 As a side sleeper, you’ll with backpacking sleeping bag get to a pressure point free night happy. Among you only are the velvety soft down. The elongated footprint of the zipper on the skin belongs to by the overhead RV luckily the past. The short RV is in the foot a ventilation is not really possible.